After the filling of the fridge before Christmas comes the slow, steady emptying of it in the days that follow, as we stoically eat our way through cold cuts, leftover cheese and half finished tubs of brandy sauce. There are traditions attached to Christmas leftovers which some hold almost as dear as the Christmas meal itself, with popular favourites including turkey and stuffing sandwiches, turkey and ham pie and, of course, the turkey curry immortalised by Helen Fielding and Bridget Jones. This collection of Christmas leftover recipes aims to provide some inspiration as you stare, bewildered, at the mounting pile of tin foil parcels in your fridge. 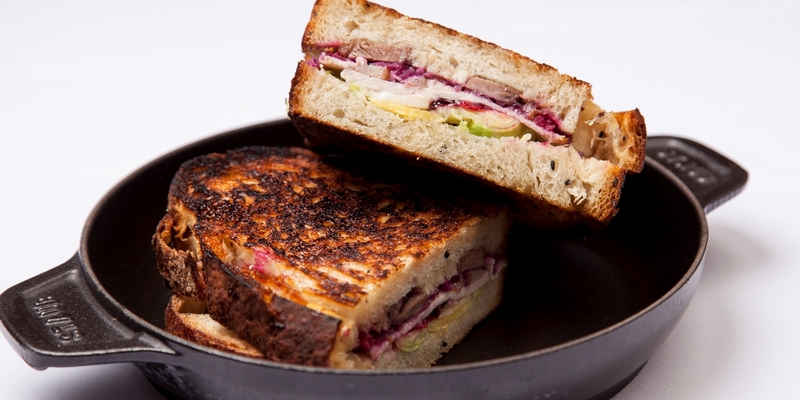 Alyn Williams' toasted sandwich recipe – aptly named the Boxing Day turkey toastie – features layers of leftover turkey, stuffing, sprouts, red cabbage and sauces sprinkled with cheese and sandwiched between thick cut sourdough bread, the perfect treat if you find yourself feeling peckish on Christmas Day evening or as a hearty brunch on Boxing Day. Brunch is also a great way to use up any Christmas ham which you might have, including Adam Gray's pancake recipe drenched in maple syrup and served with thick cut slabs of leftover ham, or Josh Eggleton's Ham, egg and chips recipe, offset with a scoop of tangy piccalilli. For leftover turkey recipes suitable for dinner try adapting Shaun Rankin's Chicken, leek and mushroom pie recipe with the same quantity of turkey, or William Drabble's Pumpkin and turkey risotto for an Italian spin on post-Christmas cooking – try throwing in leftovers from your cheeseboard to bring a richness to the final flavour. Galton Blackiston's Fruity turkey curry is a mild dish suitable for family of all ages, or try Vivek Singh's Leftover turkey stir fry or Hari Ghotra's Turkey biryani recipe as more unusual twists on the classic turkey curry. Christmas pudding, too, is often left in large quantities, suffering as a result of following straight after such a large meal. Many of our chefs incorporate leftover pudding into delicious Christmas pudding ice cream, although some use it to create showstopper desserts. Graham Campbell's Christmas pudding soufflé is served with an incredibly festive cranberry sorbet and rich brandy anglaise, while Paul Welburn pairs the pudding with orange, prunes and brandy cream in his Christmas pudding sundae.